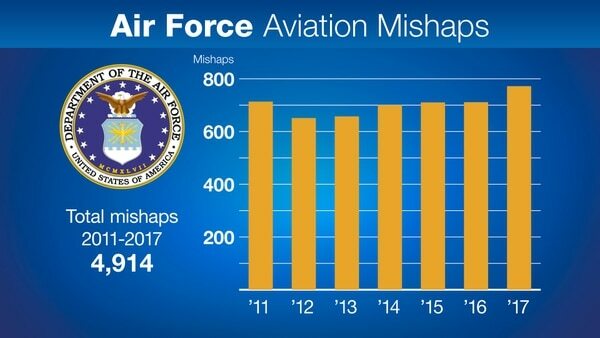 The Air Force’s overall aviation mishap rate has hit a seven-year high, fueled by a growing number of non-fatal “Class C” mishaps, which experts say is an ominous warning sign. While the major mishaps that result in deaths and cost millions in damages, known as “Class A” mishaps, are ticking downward for the Air Force, the fleet is reporting a rise in the less-severe accidents that cause more modest damage and injuries. Amid the latest spike in aviation deaths, a newly published Military Times Crash Database shows manned warplane accidents have jumped 39 percent since the 2013 budget cuts. And that may be a potential “canary in a coal mine,” foreshadowing a future swelling of more serious mishaps, said Todd Harrison, director of the Aerospace Security Project at the Center for Strategic and International Studies. “That’s your [early] warning that there’s a problem and you need to do something before something bad happens,” Harrison said. Overall Air Force mishaps rose 16 percent between 2013 and 2017, the years following the congressional budget cuts known as sequestration. Much of that increase comes from rising Class C incidents, which include any incident that costs at least $50,000 and potentially up to $500,000 to fix, or leads to injuries serious enough to cause lost work days. Many of those mishaps involved the A-10 Thunderbolt II, several cargo aircraft and the F-16C Fighting Falcon, according to Air Force Times’ analysis of data provided by the Air Force. Military Times has compiled and published online a database of individual reports of all Class A through Class C mishaps that have occurred since fiscal year 2011. Across the military, accidents involving all of the Defense Department’s warplanes —manned fighter, bomber, helicopter tiltrotor and cargo aircraft — rose nearly 40 percent from fiscal years 2013 to 2017. The Marines are still trying to recover from a loss of skilled maintainers and flight hours after 2013 budget cut. At least 133 service members were killed in those fiscal year 2013-2017 mishaps, according to data obtained by Military Times. 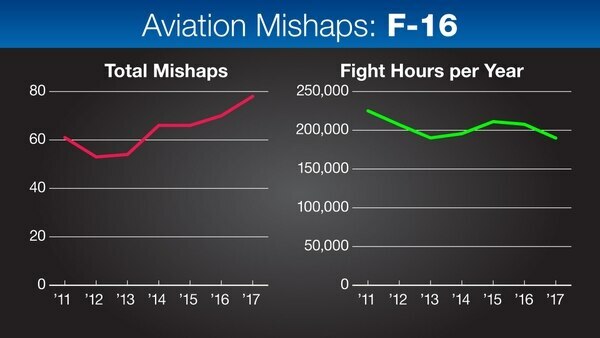 By comparison, the Navy and Marine Corps’ aviation fleet have seen far more severe increases in mishaps than the Air Force. Recent events have drawn new public attention to the issue. In the past three weeks, six more military aviation accidents have killed 16 pilots or crew, and destroyed six aircraft. That included the seven airmen killed on March 15 when their HH-60 Pave Hawk crashed in western Iraq during a routine transit flight. On April 4, there was another loss for the Air Force. An F-16 crashed near Nellis Air Force Base, Nevada, killing the pilot. The swelling of Class C mishaps comes at a time when the Air Force has grown increasingly worried about the experience of its maintenance workforce and the readiness of its aircraft. The service has reduced its shortfall of maintainers that until recently topped 4,000 — largely caused by the budget-driven drawdown of 2014 — to a shortfall today of about 200, officials said. But that success is tempered by the fact that many newly hired maintainers are still inexperienced, and the career field lacks enough seasoned 5- and 7-level maintainers. Class C accidents were the primary driver of a significant rise in Super Hornet mishaps. Meanwhile, mission-capable rates of aircraft continue to tick down year after year, and only seven out of every 10 aircraft are ready to fly at any given time. The Air Force has seen several maintenance-driven accidents that destroyed or heavily damaged aircraft in the past year. For example, an Air National Guard F-16C Fighting Falcon crashed near Washington last April after a depot maintainer forgot to include two parts when reassembling its engine. And in December, four E-8C Joint Surveillance Target Attack Radar Systems, or JSTARS, aircraft were damaged when a fifth JSTARS’ engine failed on the ground and flung debris across the ramp. While Class A and Class B mishaps have decreased since fiscal 2011, Class Cs have increased considerably. Class A mishaps result in a fatality or permanent disability, or at least $2 million in damages. Class Bs cause permanent partial disability or the hospitalization of three or more personnel, or damages between $500,000 to $2 million, Class Cs are mishaps that result in damages costing $50,000 to $500,000 or injuries leading to lost days from work. 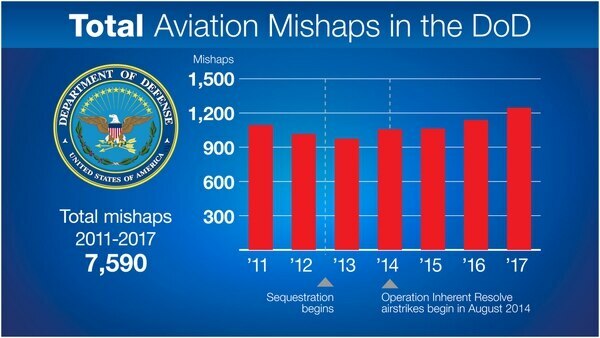 The Air Force recorded 602 Class C mishaps in 2011, which dropped down to 573 the following year. But they began ticking up in 2013 and reached 667 last year ― a 16 percent increase over their 2012 low. Army aviation's mishap rates are faring far better than the other services in the years following the 2013 Congressional budget cuts. Cargo aircraft ― particularly the C-130H Hercules and the C-17A Globemaster ― account for the bulk of those mishap increases. And of those, most mishaps stem from physical injuries when airmen are conducting maintenance or loading or unloading the aircraft. For example, the list of C-130H and C-17A mishaps over the past few years is filled with twisted ankles and knees, strained backs, broken fingers and feet, falls off ladders, slips, and concussions or lacerations from when airmen hit their heads. “The Air Force is concerned with any physical injury that occurs in the workplace. Whether it’s on an airplane or on a sidewalk, wherever it is, we’re always concerned about that,” Col. William Culver, the Air Force’s chief of aviation safety, said in a Feb. 2 interview. The Air Force on Tuesday held a memorial service to honor two Reserve pararescuemen who died in a helicopter crash in Iraq earlier this month. But while Air Mobility Command is aware of the increase in Class C mishaps, Culver said he doesn’t think it’s a drastic increase, when compared with historical trends of mishaps on transport planes. When mishaps of this kind occur, Culver said the Air Force Safety Center works with AMC to look over what went wrong and make sure any hazards identified have recommendations to fix them. But when it comes to airmen taking bad steps off of ladders and wrenching knees, or similar injuries, Culver said that there’s only so much that can be done to prevent them. Culver said that when the safety center notices an uptick in a particular type of mishap, such as loadmasters twisting an ankle on the flightline, it sends a message out to the field urging units to be careful. But by and large, it’s up to each major command’s leadership to carry out the recommended safety changes. But when a MAJCOM sees an uptick in a particular type of physical injury, they could take steps such as holding additional safety briefings to make sure, for example, loadmasters are aware of proper procedures when moving pallets of cargo. Culver said the Air Force Safety Center is looking at recommending head protection, called “bump caps,” similar to what the Navy has to reduce head injuries. Bump caps can sometimes resemble baseball hats, but have a shell to protect the head. Culver said the Air Force would need hearing protection in its bump caps, as well. The Air Force has never used bump caps because its airmen don’t usually work in spaces as cramped and confined as their Navy counterparts do. But because the safety center has noticed an increase in head injuries, it’s trying to find the best way to get bump caps to airmen. The Air Force also could bring more medical personnel on-site to quickly provide first aid for on-the-job injuries, Culver said. And the Air Force could take a look at how it builds hangars and has airmen work around airplanes to figure out ways to better prevent slips and falls, he said. Some units have also put no-slip tape on aircraft or hangar structures. “Anything like that that can keep our airmen safe, we push it out so commanders can hear about it and potentially implement it,” Culver said. Class C mishaps in the A-10 Warthog dropped from 32 in 2015 to 23 in 2016. But in 2017, they spiked up to 43. Much of the increase stemmed from gun-related malfunctions. There were three gun-related mishaps on the A-10 in 2015, two in 2016, but 13 in 2017. For example, last February at Davis-Monthan Air Force Base in Arizona, dummy rounds in the gun of an A-10 broke during an ops check, which damaged the gun. And last August, an Air National Guard A-10 at the Boise Air Terminal in Idaho had its 30mm cannon malfunction during a strafing pass, which damaged the gun. Culver said investigation boards have examined all these malfunctions, but are still trying to figure out what caused the increase in gun-related mishaps. The safety center alerted the A-10 Joint Program Office about the problem, and they’re working together to try to find the root cause. “That’s what safety is about: Identifying those trends that are out there, so that the right people can come in and fix it,” Culver said. But when it comes to the increase in F-16 Class C mishaps ― which went up from 58 in 2015 to 62 in 2016, and to to 70 in 2017, or a 20 percent increase in two years ― Culver says he doesn’t see a smoking gun. It may be that rising costs and inflation mean that minor mishaps that previously would have been categorized as Class D mishaps ― costing between $20,000 and $50,000 apiece ― are getting nudged over the $50,000 threshold into Class C territory. 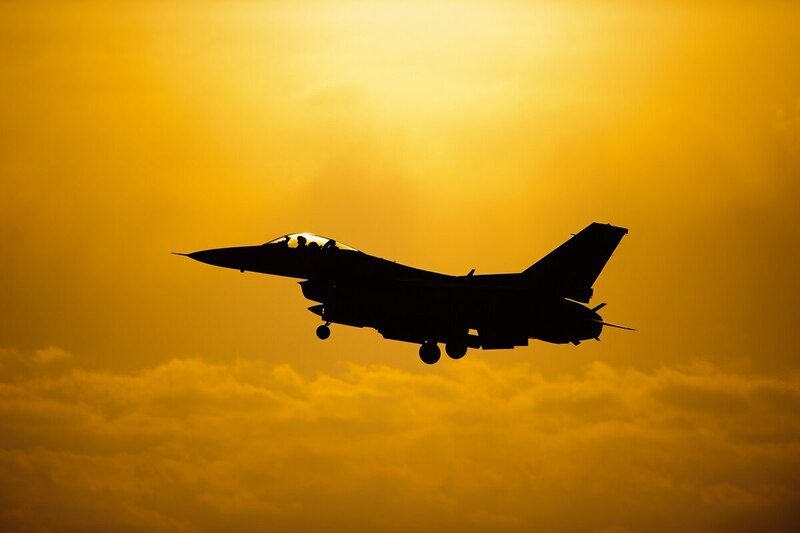 Culver also said that improved safety and maintenance could also mean that what once would have been a extremely serious Class A or B mishap in the F-16 is now a minor Class C.
And the aging of the F-16 ― the average F-16C was 25 years old in fiscal 2016 ― is also a factor. “As things get older, it costs more to fix them,” Culver said.